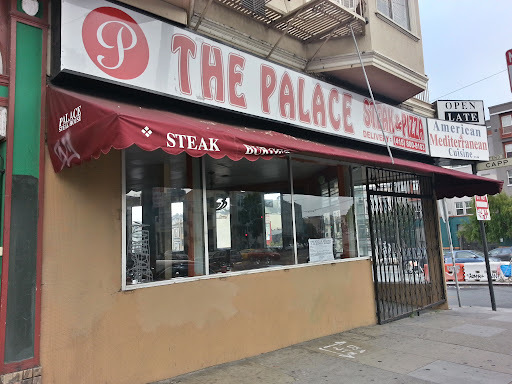 The Palace is Chef Manny's newest establishment, the former being Mr Pollo. Unfortunately, I had just missed his exit from Mr Pollo so I had to be absolutely sure this time I got to taste his cuisine. Some things to consider - you have to text for a reservation (only open Weds -Sun for dinner), its BYOB since they haven't gotten their alcohol license, and its cash only (credit card can be used for an additional 3%). The Palace digs are a little on the shabby side, but if you are really there for the food then you won't be disappointed. At $50 for the 5 course tasting menu (additional $20 for Wagu, $10 for truffle, and $10 extra for dessert), its probably one the hottest restaurants at the moment. The amuse bouche of the night was wild tuna with seaweed salad and topped with a garlic and cilantro sauce. The dish was fresh and light, the perfect start to an unforgettable meal. I wish they gave a menu of dishes so I could read all that went into each dish. 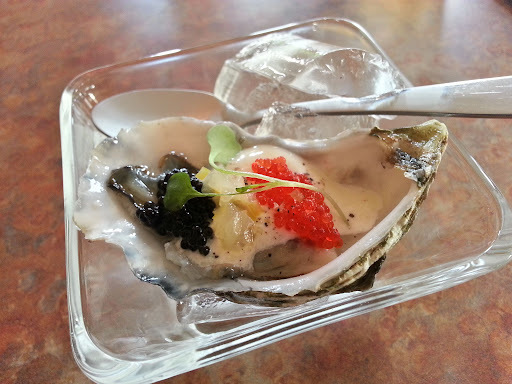 The first course of the night was a Miyagi oyster topped with pickled ginger, tobiko, and ginger foam. I prefer my oysters as simple as possible and with the sound of all the ingredients, I was prepared to find this dish overwhelming, but it was just so simple and perfect. All the flavors enhanced the salty, brininess of the oyster. One of my favorite dishes of the night. Lobster three ways, which would be seem to be the theme of the night - the showcasing of an ingredient a couple different ways. Probably my second favorite dish of the night, each of these lobster components were so different and delicious. The lobster bisque (left) had a lemongrass curry flavor and each slurp made me want more. The lobster claw cerviche had hints of lime and cilantro. The lobster tail with habenero water was surprisingly very spicy, but I loved the kick. 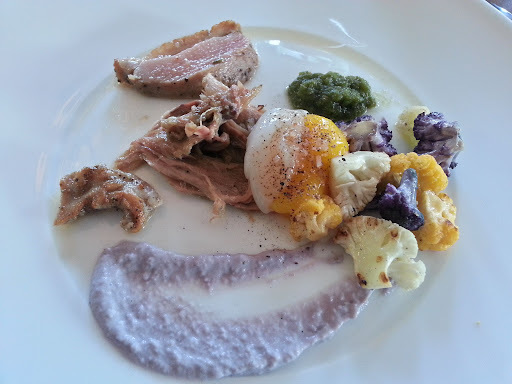 Duck multiple ways - confit, breast, and sous vide egg. Fresh farmer's market cauliflower decorated the plate with fun colors and who knew cauliflower came in purple? The duck dish also came with a $10 truffle supplement, which was shaved on tableside. 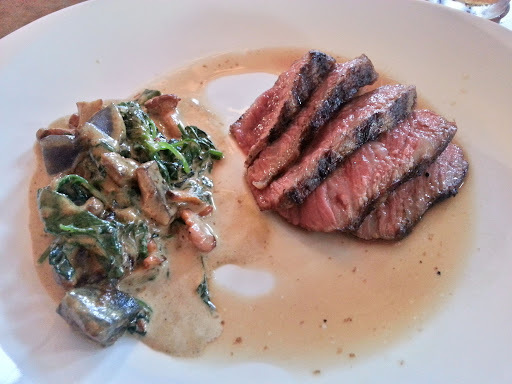 It provided a little earthiness to the dish, but even without the truffle this dish was still stellar. Pork served in multiple ways - chorizo, chicharron, tenderloin, bacon, and riblet. The different beets were splashed along the plate in a multiple preparation of their own. The peaches and beets gave this pork dish some sweet notes. The sirloin steak with creamed spinach was so delicious. The meat was served a perfect medium rare (as all beef should be) and their version of creamed spinach was full of flavor with chunks of root vegetables and spinach. For an additional $20, you can substitute the sirloin steak for wagu beef. While the Wagu beef was super tender and buttery, the regular sirloin steak was cooked so well that the difference between the meats are very close in taste and tenderness. The meal ends with one dessert option. Tonight's was a dulce de leche souffle with fresh berries and a scoop of housemade mora ice cream. Mora is a berry found in Columbia that has a flavor similar to a subtle raspberry.